Legit off-road cred. A list of faults. Strangely likeable. 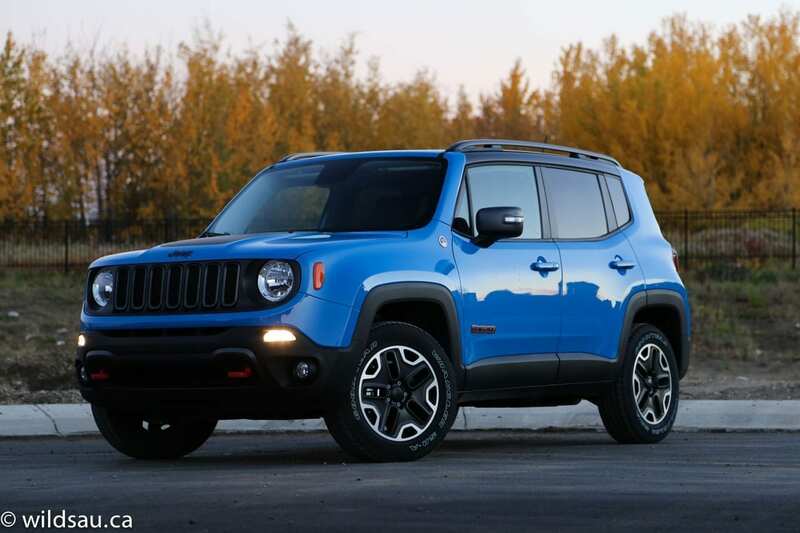 As we’d expect from any “real” Jeep, the all-new Renegade was designed and engineered in the good old U.S. of A. But ssshhh, it’s actually built on a global Fiat platform, by Fiat, in Italy. 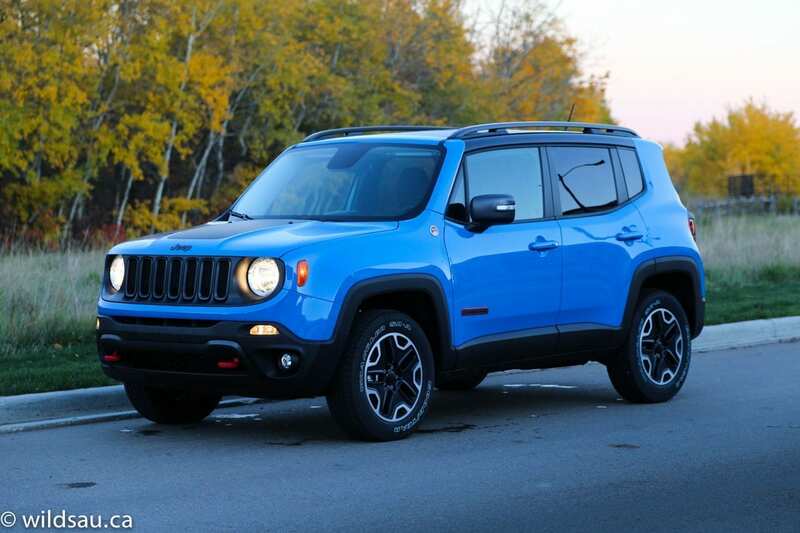 I literally burst out laughing when a gentleman in a brand-new Jeep Cherokee pulled up beside me, rolled his window down and advised me that my Renegade is not a “real Jeep”. I thought that was pretty rich, coming from someone who was also driving a Fiat-based Jeep. While the reactions to the Renegade’s styling were love-it or hate-it, most were on the love-it side – plenty of people asked what it is, and then declared that they liked the looks. I did too and appreciated the effort put into setting the Renegade apart from the competition while making it obvious that it’s a Jeep product. 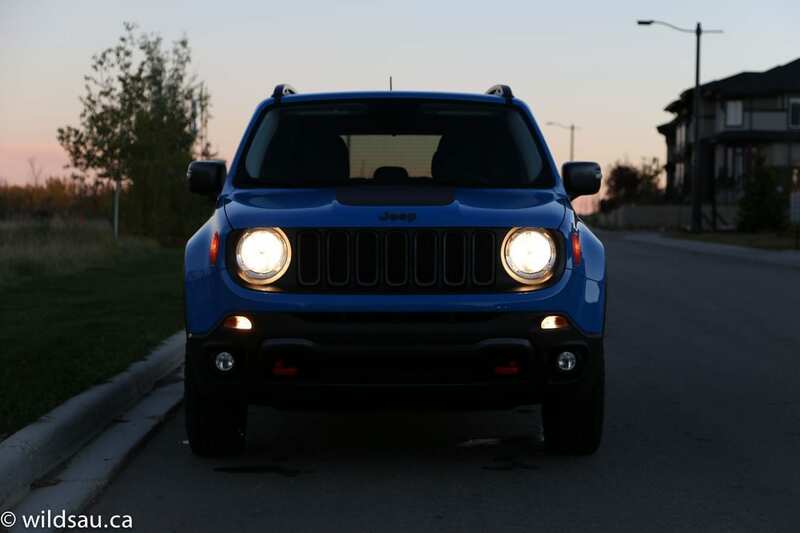 Its squarish, boxy shape implies utility and capability – it suits the Renegade’s implied mission. 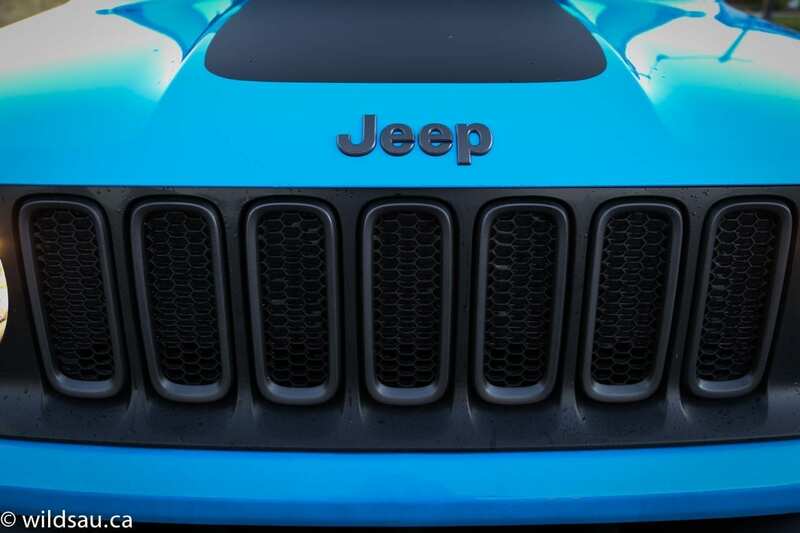 Yes, the classic 7-slot Jeep grille is intact – it’s nearly vertical, just like the windshield, and the whole vehicle has a rough-and-tumble sort of look. 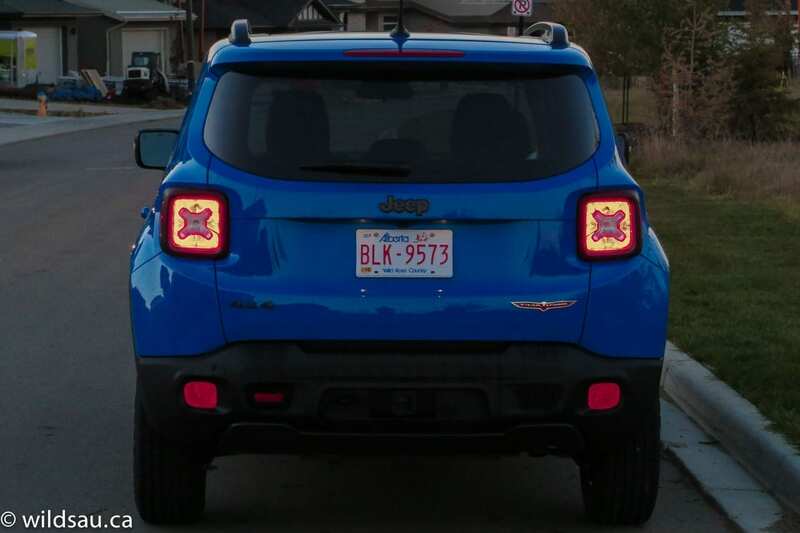 But they’ve somehow imbued the Renegade styling with a bit of fun and character – including the strange square tail lights with “X”s in them – the X motif comes from army jerry cans. 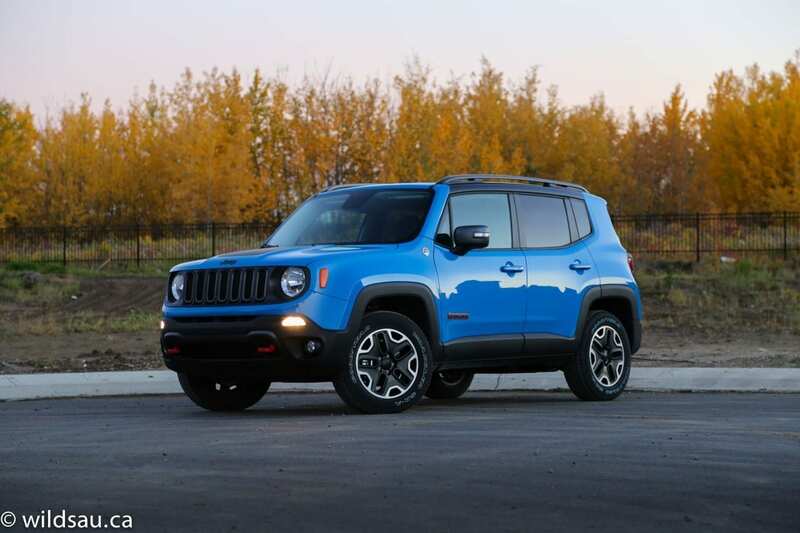 In fact, many of the Renegade’s features appear to be exaggerated and overemphasized – the huge round headlights and the huge wheel wells are examples – to catch your eye. And it works. 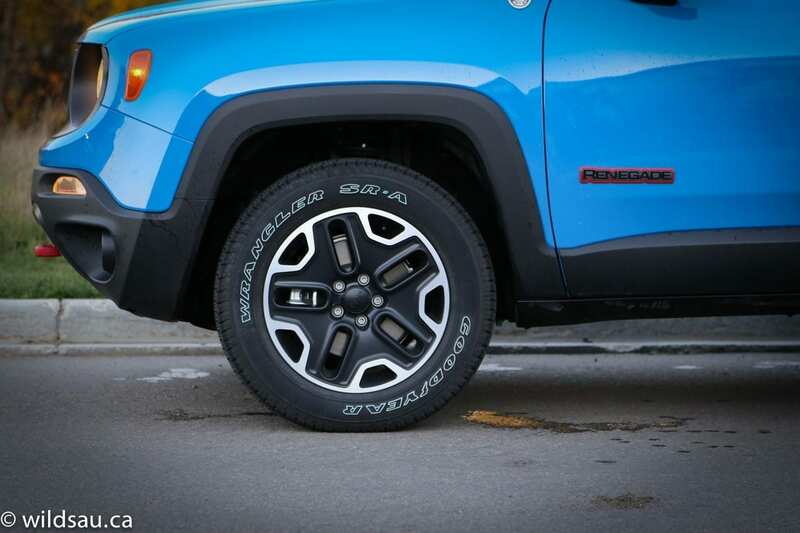 The black decal on the hood gave my bright Sierra blue Renegade a bit of a rugged Tonka-truck appearance and its 17-inch rims look like they mean business. You get a full-size spare too. Once you’re in, you’ll find that the cockpit has an open spacious feel to it thanks to the ample head room. 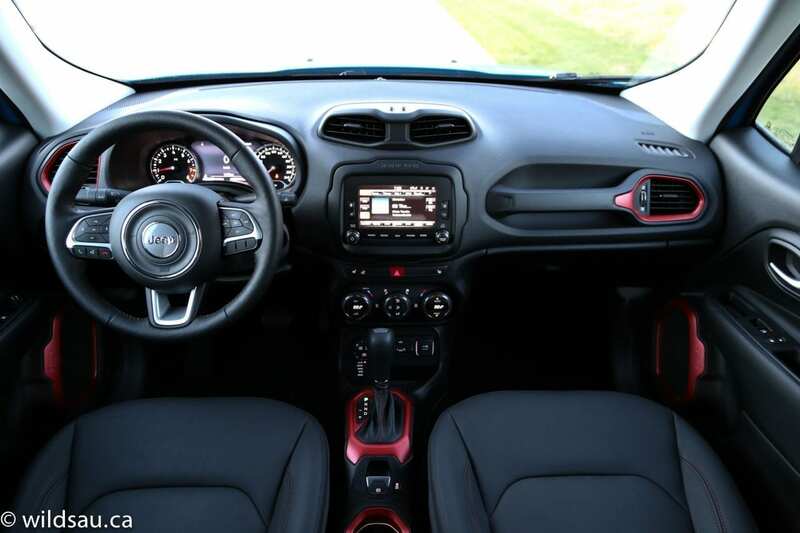 The interior materials are just OK – the dash is made from a giant piece of soft-touch plastic but otherwise you will find plenty of cheaper-feeling hard plastics around the cabin. It is mostly black and the few splashes of coloured trim that are likely supposed to come off as playful do little to liven the somber mood. It wouldn’t be a Jeep if it didn’t have blocky, brawny styling and grab handles aplenty – that’s all here. Fit and finish is middling, with interesting anomalies like the foam insulation pad blatantly sticking out where the bottom of the steering column meets the underside of the dash. I really like the large driver information screen between the gauges – it is easy to read and navigate and provides access to a ton of information. 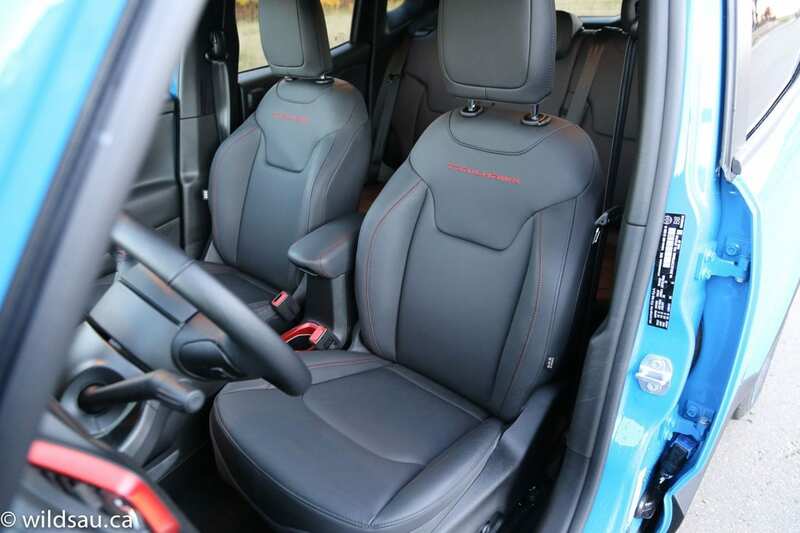 The comfortable seats are heated, as is the steering wheel. 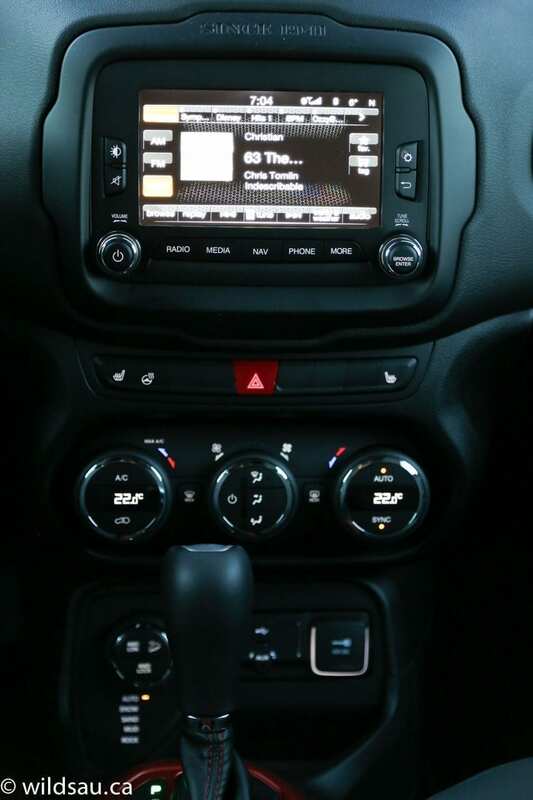 The smallish 6-inch touchscreen handles all the media, phone and navigation goodies. I quite like the Uconnect interface and found it easy to handle. The sound system is quite good. There’s a dual-zone climate control system below. 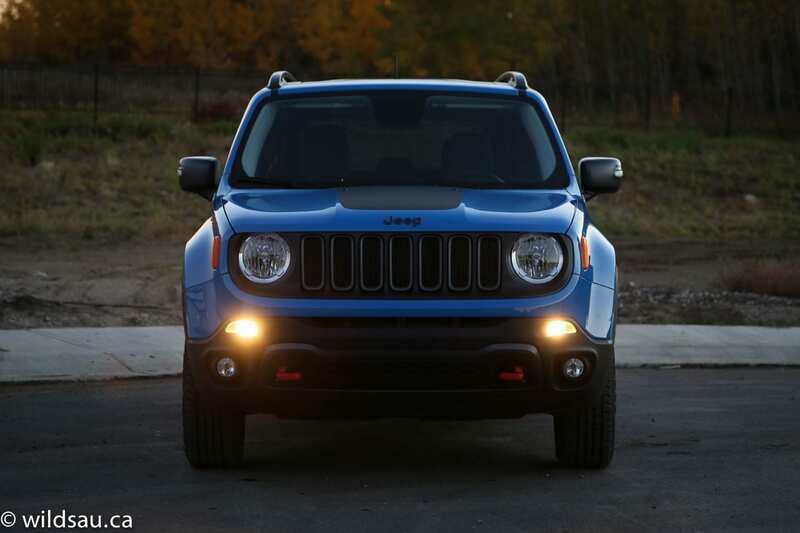 Overhead, the Renegade continues to give Jeep heritage (that loves removable body panels) a nod. 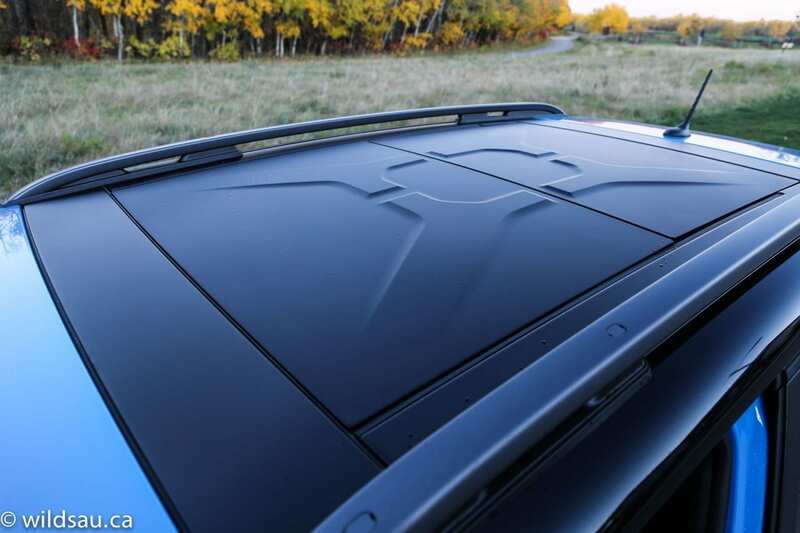 Two solid roof panels make up most of the roof – the front one is a sunroof that tilts and slides back, but both are actually removable for an open air driving experience. You get a big nylon bag that fits across the floor of the trunk to hold the panels after you’ve popped them out. Jeep tries to throw in a few little references to how awesome your life are going to be, now that you’ve bought a Jeep. 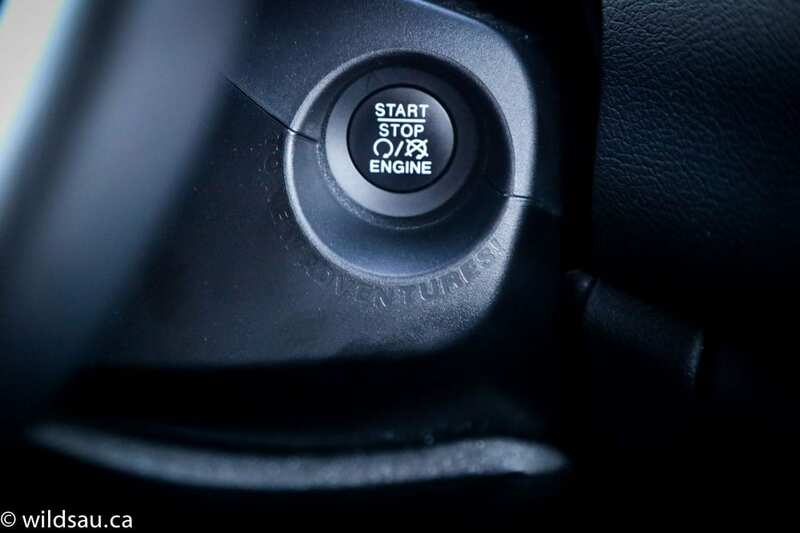 For example, it says “To New Adventures” below the push start ignition, and there is a topographical map embossed into the rubberized mat in one of the storage bins – you explorer, you! And let’s not forget the thrilling paint-ball splat that replaces the redline on the tachometer. My review vehicle had a bit of driver assistance technology – a back-up camera with rear cross-path detection and a blind-spot monitoring system. The second row has three seats, each with a headrest. 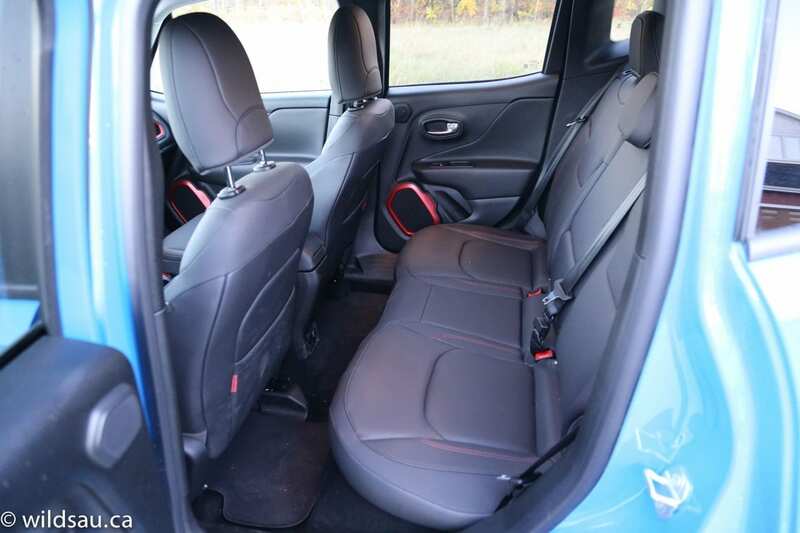 I found that the leg room and foot room were more than enough for me at 5’10” and head room is just as generous as up front – all of this makes for a spacious rear seat. The middle position is a bit tight, width-wise, and runs out of leg room thanks to the centre console. Our three kids were happy in the back, and there are two sets of LATCH anchors for child seats. The only extra is a very convenient 115V household plug on the back of the console. There’s a small drop-in bin at the front of the centre console, where you will find a 12V plug and your USB and auxiliary connections. You’ll also find a little storage space under the armrest lid, along with a second USB plug. 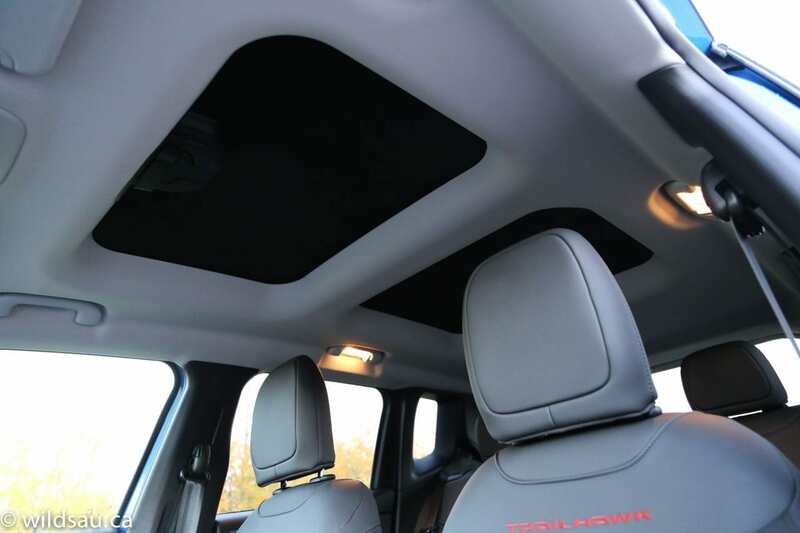 The Renegade’s trunk felt big to me – it’s competitive at 524 litres. 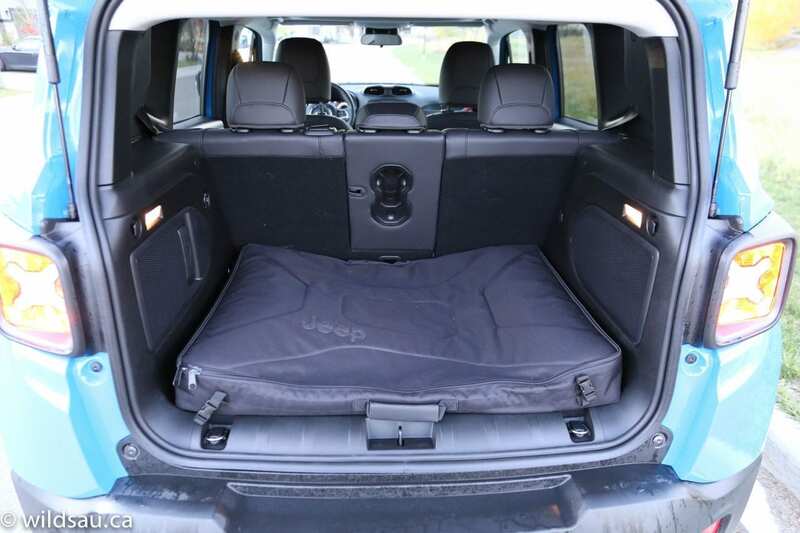 The rear seats fold down in a 40/20/40 split, which gives you a lot of flexibility when you need to add cargo space – flip them all down, and you’ve got 1438 litres. 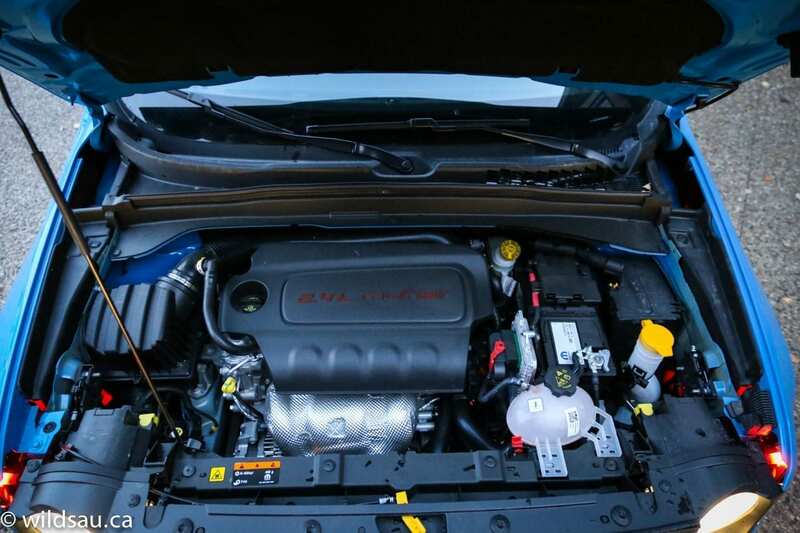 FCA’s Tigershark 2.4-litre 4-cylinder motivated my Renegade. 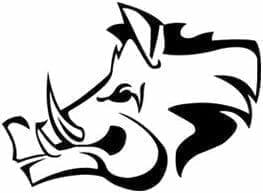 It puts out 180 HP and 175 lb.ft of torque. It’s not as efficient as other players in this class – Jeep says it will use 11.2 L/100 km in the city and 8 L/100 km on the highway. I ended up averaging 11.2 L/100 km during our week with it, which included plenty of city commuting as well as more freeway cruising than usual. 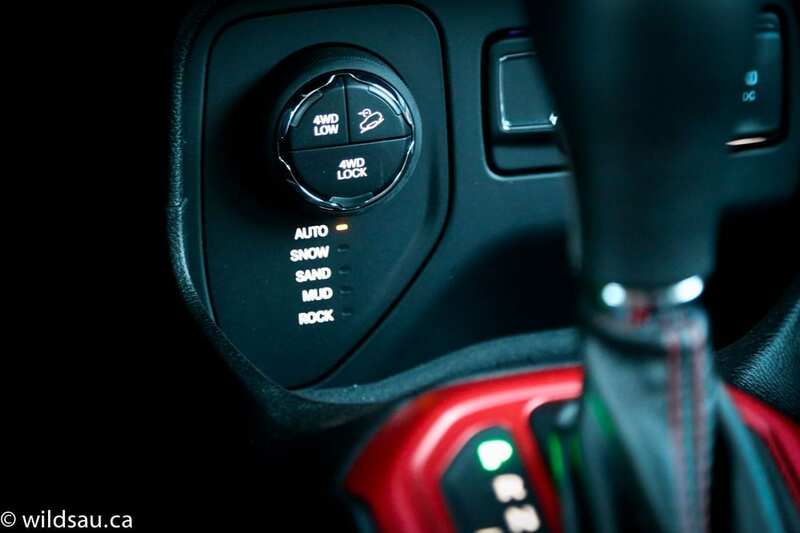 The Tigershark’s power is sent through a 9-speed automatic and on to an all-wheel drive system. Towing capacity is best-in-class at 907 kg (2000 lbs). 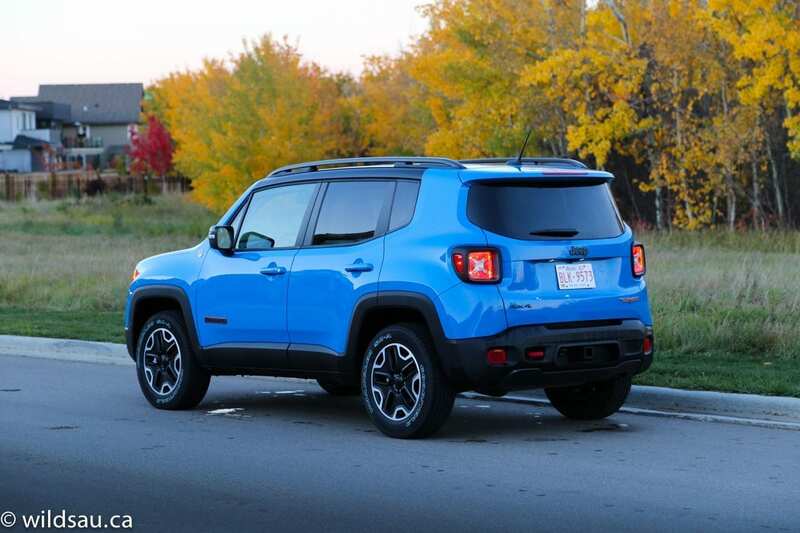 If you’re after refinement on the road, the Renegade isn’t going to be a top contender. The engine makes a lot of noise, and that noise isn’t particularly pleasing. And while it sounds like it is working hard, it’s still not a very powerful vehicle. 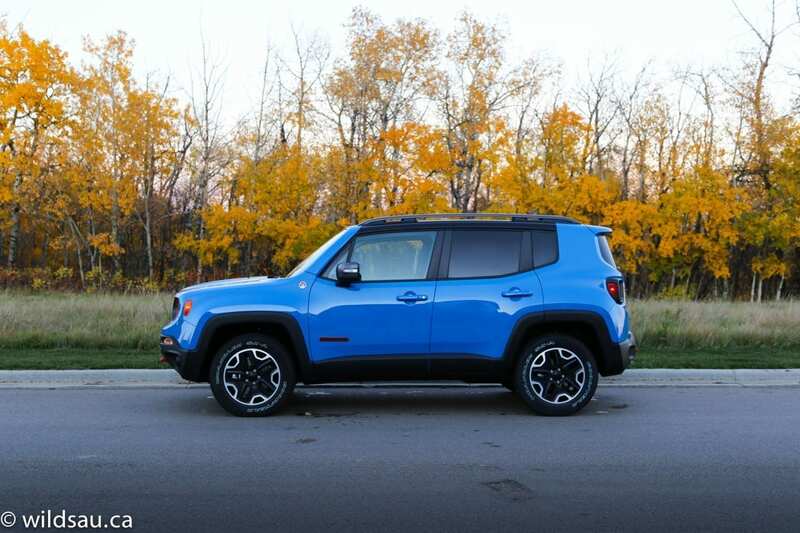 It has enough power for around town, but if you need to get into traffic quickly, or you’re passing someone on the freeway, say your prayers and hope for the best, because it definitely takes some time to build up momentum in the Renegade. It definitely feels underpowered in those situations. The transmission doesn’t help matters. It’s relatively slow when it comes to shifting (that includes when you manually shift it) and it often lurched when I applied the throttle, especially at lower speeds. Add to that the fact that there are an awful lot of gears to hunt through and it makes for one of the less impressive transmissions out there, especially when it leaves you with a temporary power vacuum as it decides what gear it should be in. ENGAGE PANIC MODE! The Renegade’s ride is quite firm, but never on the side of harsh. And frankly, I prefer it this way as it comes with controlled body motions rather than a squishy, we’re-all-about-the-comfortable-ride handling situation. Yes, it’s still a tall vehicle and yes, it feels a tad top-heavy and yes, it leans a bit in corners, but it’s a well-balanced suspension that offers great handling and a decent ride. I found the vehicle to be noisy on the road, and the Jeep’s shape doesn’t do much to quiet things down on the highway – wind noise was very noticeable. Perhaps the biggest issue when it came to the driving experience (other than the transmission) was a coarse grinding I felt in the drivetrain almost every time I let off the gas pedal and coasted, especially at slower speeds. It felt very much like the temporary binding in a true 4×4 system when you’ve just disengaged it. It was very noticeable and very irritating. 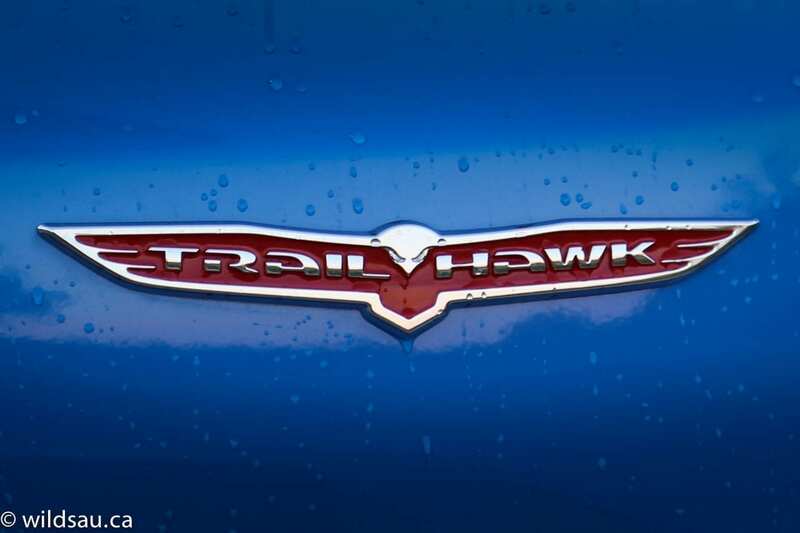 When it comes to off-roading chops, the Trail Rated Trailhawk trim has some genuine credibility. 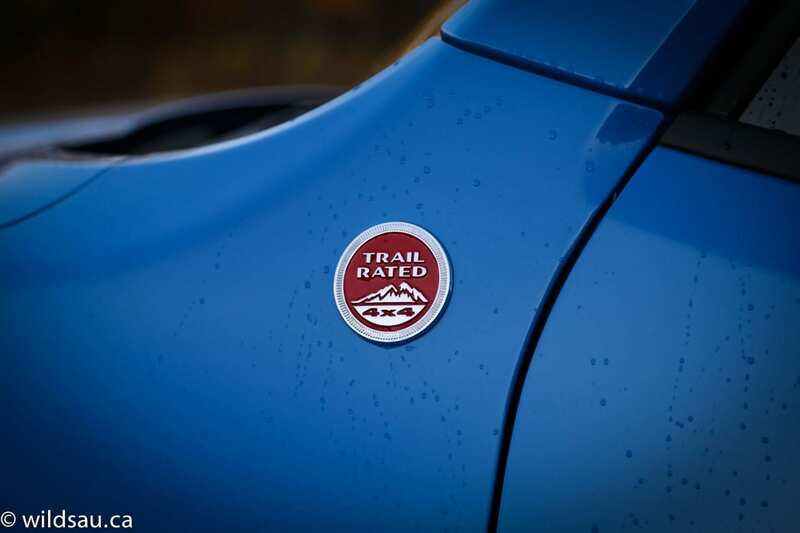 If you’ve ever wondered what Jeep’s Trail Rated badge means, it indicates that said models have been engineered and designed to perform in the categories of traction, ground clearance, maneuverability, articulation and water fording. And that is nothing to sneeze at for a production sub-compact crossover since many of its competitors will balk at being asked to jump a curb. Its all-wheel drive system normally sits in automatic mode (which means it’s front-wheel drive until it senses slippage), but also comes with a low mode, a full-lock and a hill-descent mode. And you can also turn the Selec-Terrain dial to access software-driven terrain-specific 4×4 modes: there’s Snow, Sand, Mud and Rock. And finally, the Trailhawk sports true skid plates and usable approach and departure angles, as well as some serious ground clearance. Did I test any of this stuff? Not really. I did clamber through some big mounds of dirt and mud on some construction sites though, and I have to say I was duly impressed. Not only did it tackle the inclines and descents like a champ, but even in automatic mode, the all-wheel drive dished up plenty of traction to keep things moving. I honestly don’t think the other competition in this category would have stood a chance on this terrain. So why would you buy this thing? Sure, it brings plenty of cool to the game, and yes, it’s actually a capable little off-roader. But my question is: if you’re serious about off-roading and willing to put up with the associated compromises, wouldn’t you be considering a Wrangler instead? Because while this thing is truly off-road capable (to a point), it’s not a Wrangler by any stretch. WAF (Wife Acceptance Factor) was surprisingly high. She thought it looked cute and said she actually enjoyed driving it and that it felt “confident” as she scooted around town. Somehow, even with its list of faults, the Renegade was a charming little vehicle that grew on me and was hard to give up. But when I compared it to the rest of the category it competes in, I found it to be noticeably more heavy, less efficient and significantly more expensive. 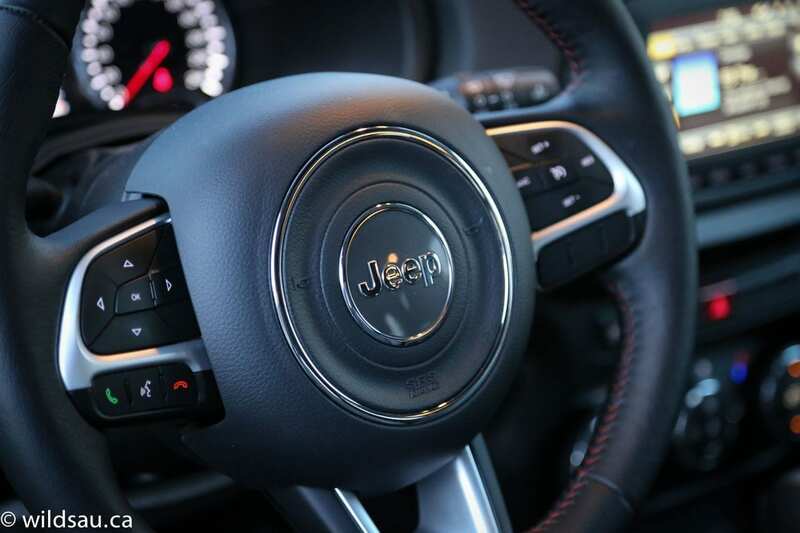 I guess it fits right into the “it’s a Jeep thing” phenomenon – for many buyers, it’s a lifestyle choice that they actually can’t explain, rather than a practical decision. Hey, if this little warrior checks off all the boxes on your shopping list, why not?